1. Chores are REALLY hard to get done when kids are awake and generally being kids. 2. Toddlers LOVE doing what adults are doing. So let's take advantage of these two facts, get some quality one-on-one time with your kiddo, and teach a bit of responsibility and/or life skills while we're at it. The way we split up our household duties, I generally have the most Sisyphean of tasks: dishes and laundry. Forget any old gender-normed jokes - anyone doing a family's dishes can safely be called Dishyphus. Anyway, their frequent repetition (and in the case of laundry, spread of the task throughout the day) and extreme similarity from day-to-day makes them great places to solicit some toddler help. Why have your toddler help? Won't that just make moderately unpleasant tasks unbearably sloowwwwwwwww? Yes, it will be slow. Of course, just about anything your toddler does is slow, so this isn't really much of a change. But, more importantly, this is a key case of "compared to what?" Can you empty the dishwasher by yourself in less than an hour? Of course, but do you want to spend your precious time when the children are asleep doing it? Or, more realistically, you can now spend their sleeping time doing the inevitable additional dishes (there are always more dishes), but with a much smaller stack. And even if it does take an hour to do "together," so what? My daughter pretends in her ever-elaborate toddler ways to do the dishes anyway. Why not at least play together and wind up with some clean real dishes at the end? Also, of course with practice, they'll need less supervision and be faster. Continuing with the emptying the dishwasher example, we've approached a speed pretty close to having me do it alone, but with all the benefits of having her help too. How about just playing with your kids? So first, who says that play and chores aren't the same thing? But even if I accept the premise, kids and family and chores and everything else live in the real world. Dishes and laundry and grocery shopping and cooking and all the other things have to get done. I'd much rather live in a world where we have a good time doing these things together than have the weight of the list on my shoulders while Trying Very Hard to HAVE FUN and then having a million things to do after bedtime and no time to relax. Less anxious parents are also better parents. PLUS... the line between play and work is pretty fine for kids of this age. Left entirely to their own devices, kids playact the things they see in their lives. Just today my daughter has, when playing, pretended to cook dinner, wash dishes, bring all her dolls to the bathroom, and have them line up for the potty just like they do at daycare. And if that wasn't enough convincing (and let's be honest, anyone who knows me knows that I don't understand the concept of "enough convincing"), experts and even science agrees with me. One-on-one time, even when done as a joint project, or smooshed into other activities gets the approval of Dr. Harley Rotbart (of No Regrets Parenting , a book I haven't read, but have heard of) and this New York Times article. Furthermore, the Wall Street Journal cites multiple studies, scientists, and experts who find kids who do chores (and start them earlier in life) are more empathetic as well as more able to be self-sufficient. So let's give this a shot, what kinds of activities do you do? How do keep it useful, safe, sane? From about when she could walk, our daughter was interested in watching and helping with the laundry. Given that it's a long series of small tasks, it's pretty easy to find something for almost any age kid to do for at least part of the cycle. * Do they know clothes types? "Put all the socks in this bin," since they're all washed warm anyway. * Do they know their colors? "Help me find all the white shirts and put them in this pile." * Working on shape recognition? Learn the laundry symbols together! "Can you count the dots or lines on this tag?" * Early reader? "Can you find the word 'Warm' or 'Cold'?" * Plus a dive or two into a pile of dirty clothes is admittedly pretty fun, and no grosser than anything else they'll do. * Living on one floor, with hardwood floors, and with low-friction laundry baskets, our daughter started insisting on dragging the (lighter) hampers to the laundry room on her own before she was two. * She's also found great joy in me turning the hamper on its side, her crawling in, pulling out a few items, and placing them directly into our front-loading washer. It's slow as hell, but my back has also found great joy in this too! * If she can put them in the washer, she can take them out and hand them to me to put in the dryer (stacked way too high for her at this point). My back thanks her again. * Like all modern washers, ours has a multitude of buttons. For now, I do all the setup, but she knows where the start button is and when to press it. She's also getting the hang of the soap dispenser; she's not quite ready to empty soap into it or pour from the bottle (though she offered this morning). Depending on your interface, you may have other buttons or knobs that you can use to match the laundry labels or practice some reading. This may be something you only want help for the kids' loads, but it's another great way for them to take some ownership of their lives and to give you a hand. * Or even just hand you one item at a time to hang, again helping out your back. doesn't mean you can't wear a fun hat! Obviously the dishes present more safety challenges than the laundry, but there's still plenty to do. First, and most important, we put her cups and bowls in a bottom drawer of our pantry so that at mealtime, she can get her own things out and help us set the table. Because of this, our first stage of helping with the dishes was putting away her own clean plates, bowls, and cups (after washing her hands, of course). I'd take them out of the dishwasher and put them somewhere she could reach (first placing them out one at a time, and then later in a stack). Busying herself running back and forth to the pantry one plate at a time bought me lots of time to empty out the rest of the dishwasher. Next, she's started helping put away all the silverware, which is frequently all I have left after the time she spent putting away her own things. After I first put away all the knives, she sits in one of our high stools and matches forks and spoons from the dishwasher basket to what's in the drawer. As of right now, she still doesn't have much intuition for what goes where, but it's a great opportunity for me to suggest she "run a experiment to see where it fits." 2. Her plates/bowls/cups for her to place where I point to in the dishwasher. * At the grocery store, help steer the cart (this also helps them stay close with a hand on the cart). * Also at the grocery store, carry the box/can/etc. to the cart and place in or hand to another adult. Helping at the grocery store is also a good way to keep little bodies active and little minds from getting bored enough to start causing mischief. * Help set the table for dinner. Even if you don't want her carrying your fine china (you don't), she can place napkins, bring over her own plates and cutlery, and as you trust her more, carry small containers of food or toppings/condiments to the table. * And as you loyal readers know, they can help cook! Ok, so, after all that discussion of my amazing help with chores, I have to remind you, this is the real world with a real kid. * Some days she disrupts my ability to get anything done. She's a toddler, and like all parents, I do some combination of roll with the punches (preferred), fume (acceptable backup plan), and actively get frustrated at her (we all do it sometimes). * Some days she has no interest in helping and prefers to play by herself while I get some things done. This is obviously fine and the fact she can articulate her preferences and feel confident playing alone is great! * Some days she will want to help with one step of the process but not others. That's fine too; we're still too young for these to be chores/responsibilities and we're not forcing her to do any of it, so if she wants to help sort but not fill the washing machine, that's great. I got help sorting! * Something will get broken at some point. Life will happen. Regardless, the final upside to all this is that my child has some basic understanding of what it takes to run a household - clean dishes and clothes don't just appear out of thin air, and neither do groceries or dinner. In our house, they take work. At this age she can help or she can entertain herself while that work happens. Either way, she sees that the world doesn't entirely revolve around her moment-to-moment desires. And, of course, we get to spend some great one-on-one time that fills her need to feel like a big girl and my need to have clean pants for work. Excited your kid walks everywhere? Live somewhere it snows? You need footwear! So maybe this is just the PTSD talking from having survived Boston in February 2015 (that picture was only after the first storm), but boots really are a necessity if you're going to keep walking, taking the bus/train, and living your life in a northern city. When our eldest was a baby, some fancy designer boots were a fun gift to get, but now that she's 2, going on 22, waterproof, warm, and easy to put on is a must. 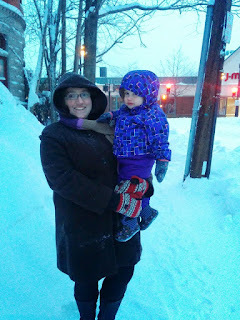 Toddler, scared of walking on snow after the 1st storm. We've had a great experience with Bogs Baby Boots (Amazon, Zappos) (which are a misnomer as the sizes really run all the way up to adults practically). All of them are quite appropriate for boys and girls. Styles are available that will satisfy everyone from the non-conformists to the folks out there gunning for more gender targeted products. The pair modeled in the picture are the "indigo" variant of the Flower Stripe boot. That link takes you to a search for all the various styles and colors. Back to the practical, not only are they waterproof, but these boots are machine washable so even the yuckiest of slush is not a problem! Ok, even a "normal" winter up here means good warm socks are needed for kids and adults alike. Our winner for the whole family is Smartwool. You can search for Smartwool for everyone here (Amazon) or here (Zappos), Smartwool socks have the feel of something thick and heavy but still fit into most shoes. They breathe pretty well too, so you don't have to talk your toddler OUT of wearing them on a warmer day when she REALLY REALLY REALLY WANTS green socks and these are the only green socks you own. For what it's worth, I also own a Smartwool sweater for the really cold days, so they've got me sold. Note: This post is footwear focused, but in case you're checking this out in the midst of winter weather before we can write about coats/snowsuits. I'll let you know the snowsuit above (that we love!) is from Columbia Sportswear. Find their stuff on Amazon and Zappos.